Have you noticed any major leaks from the sides of your electric shower? It’s normal to be concerned about such an issue. After all, you don’t need a doctorate in chemistry to know water and electricity don’t mix well. But thankfully, the fix to this issue is actually quite simple. In most cases, it only requires a basic pressure relief device (PRD) replacement. 1 So, Is It Safe to Use a Leaking Electric Shower? 2 How Is the PRD Connected to a Leaking Electric Shower? 3 How Do You Replace a PRD? 4 What If You Need a Super-Quick Solution? So, Is It Safe to Use a Leaking Electric Shower? Again, it’s water mixing with electricity here. It’s not something you’ll want to mess around with. Seriously, go to your fuse board and shut off that power fuse to your electric shower now. This way, you’ll avert any potential shocks or injuries. How Is the PRD Connected to a Leaking Electric Shower? In simple terms, your PRD is a safety feature that prevents excess pressure from amassing in your electric shower’s heating tank. But, when you get to much pressure built up, the PRD (and/or its parts) has a habit of popping out of your electric shower. As a result, you get the mess we’re in now with a leaking shower unit. Thankfully, PRD replacements are ultra-cheap—less than £10 in most cases. And replacing them is so easy that you shouldn’t need a mechanic or plumber. In other words, installing a new pressure relief device is a DIY project that only takes a matter of minutes. Start off by making sure your showerhead isn’t blocked from excess scale or debris. If you find any icky stuff inside, vinegar and lemon juice work as great home remedies to break down any troublesome limescale. Also, check your hoses. Any kinked, damaged, or collapsed hoses are a quick way to push out a PRD replacement. So replace any problematic hoses before they make any further work go to waste. How Do You Replace a PRD? 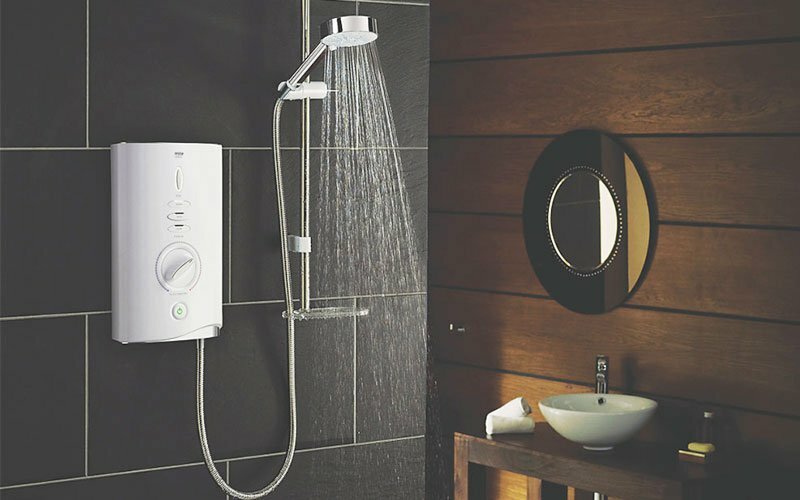 Now that everything checks out okay, it’s time to get a new PRD on your electric shower. Here’s how to do so in as short of time as possible. If you haven’t done this step already, then do it now. The last thing you want is to get electrocuted while replacing a basic shower part. Thankfully, you won’t need many tools for this job. Simply get a towel or cloth to avoid any messes. Also, you’ll want a positive screwdriver to help with screwing in your new PRD. This step is pretty straight forward. But sometimes, you’ll need to unscrew this piece. And in many cases, you’ll find the main screw located behind the brand’s badge. For most electric showers, the PRD is located near the base of the outlet pipe. Start by unscrewing and removing your existing PRD (if it’s still in place) and O-ring. From here, you’ll insert your new PRD and O-ring. Sometimes, the device will pop directly into place. But other times, you’ll need to use a bit of force and strength. So don’t be afraid to apply a bit of elbow grease here. Once you get your new O-ring and PRD into place, you’ll simply need to screw them back into place and you’re good to go! What If You Need a Super-Quick Solution? Not to worry. In many cases, you can push the small ball back into your blown out PRD with minimal effort. This should temporarily stop your leaking—or at least mitigate it. However, this isn’t a reliable, long-term solution. The instant you start your shower back up, that PRD ball will simply blow out of place once again. So while it’s not a reliable fix, it gets the job done if you have other urgent matters to attend to. It should go without saying that you won’t want to use a leaking electric shower. But at least replacing a PRD is a quick, cheap, and effortless DIY project. Thus, follow along with our steps above to get back to safely enjoying your showers.